The customer management console has been updated to make it easier to track how many endpoints are being installed each day with the new “Agents Installed” Report. This Report will be especially useful during larger deployments to keep track of new agents. 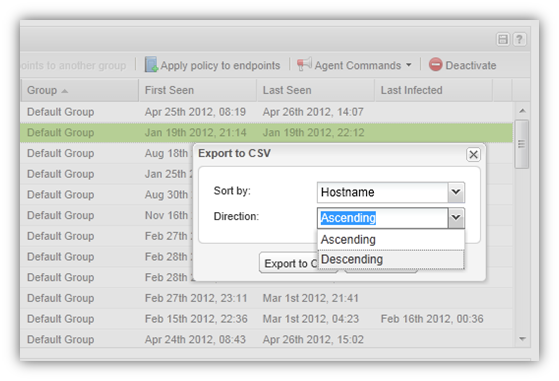 Other changes have also been introduced to make finding and sorting endpoints even simpler. New Report > “Agents Installed” - This report allows an administrator to easily query and view the agents that were installed in a given period. Export to CSV > Group Management – By clicking on “Export to CSV,” the administrator now has the increased option of 5 directionally-sortable fields with which to sort user agents. “Group Name” - The Group Name is now added as an additional column labelled “Group” within the “All Endpoints” table, making it easy to see and sort by Group Name when using the “All Endpoints” table. 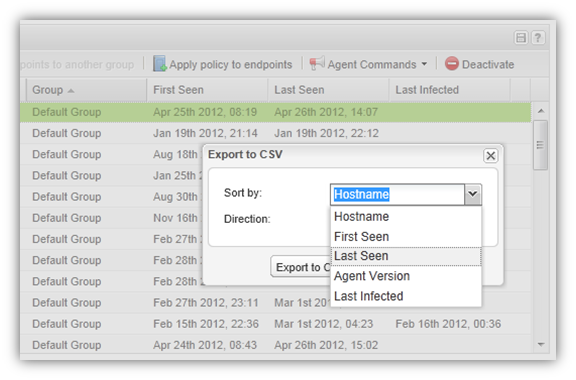 Five sort selection fields are now available under the “Export to CSV” option – Hostname, First Seen, Last Seen, Version, Last Infected. Plus, the Direction can be set as either Ascending or Descending. 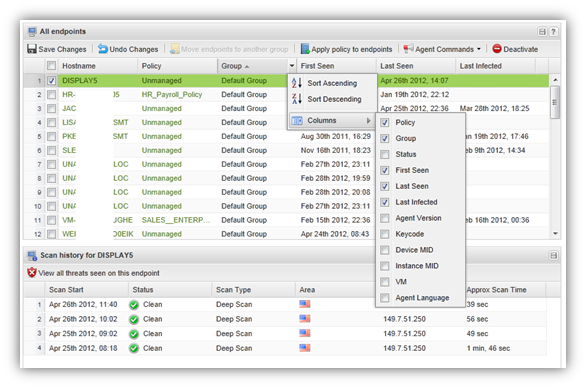 Under the Group Management tab, it is now possible to sort "All Endpoints" under their Group Name by selecting the "All Endpoints" Group. A "Default Group" name sort is illustrated below.